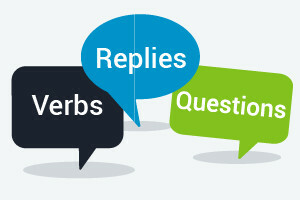 This free online English grammar course is designed for beginners who want to learn how to ask and answer questions. The course will cover English action words, how to form questions in English, and how to talk about what you are doing in English, all in a really simple way. The course also includes audio files of native English speakers, which will help you become familiar with the English accent and develop your English listening skills. This course will first teach you about English verbs and action words, along with their correct usage in a sentence, so you can easily talk about what you are doing. You will learn then how to construct 'can' questions and talk about the ability to do something. The course will also cover the present simple tense in English so you can learn how to talk about something that is currently or regularly happening such as "She feels hungry" and "I love ice cream". By completing this English learning grammar course you will gain a much clearer understanding of English verbs and their uses. The audio recordings in this course are also a great way of practicing your listening skills, which is very important when learning the English language. They say that to be good at something, you need to practice every day. So, start with this free online English course now, stick with it, and keep getting closer to your first perfect English conversation!